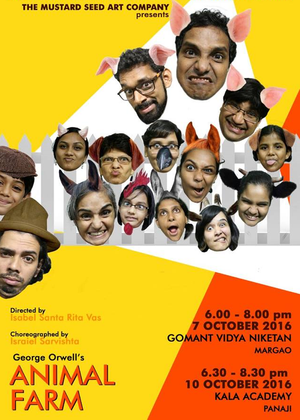 The 7th and 10th of October 2016 saw a production of George Orwell’s Animal Farm staged by The Mustard Seed Art Company. Audiences who caught the play adapted from the famous novel at Gomant Vidya Niketan (Margao) and Kala Academy (Panaji), were fortunate indeed. Those acquainted with Orwell’s novel, written in 1945, will certainly make connections with its allegory which retells the political scenario of the time, with Communism hailed as the answer to society’s problems. The novel mirrors the events that took place from before the Russian Revolution of 1917 to the rule of Stalin. The satirical novel, by his own admission, is Orwell’s first deliberate attempt to use literature towards a political revelation. The play produced by The Mustard Seed Art Company was adapted for theatre from the novel by Peter Hall. 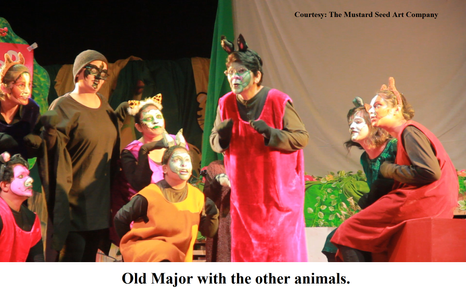 The play opens with old Major, the boar, fomenting the spirit of rebellion among the farm animals with his tirade against humans. After old Major dies, the younger pigs Napoleon and Snowball carry the baton in leading a rousing revolt against the drunken and neglectful Mr Jones, the owner of Manor Farm. Manor Farm is renamed ‘Animal Farm’, and Snowball and Napoleon set up the seven commandments of Animalism, of which the most important is ‘All animals are equal’. The commandments are summarised in the oft repeated ‘Four legs good, two legs bad’, to emphasis the superiority of animals over man. All decisions are to be taken by a democratic vote and all animals are to work for themselves in this new social environment. Snowball takes it on himself to educate the animals to varying degrees of success, and Napoleon trains Mr Jones’ puppy. Everything seems fine for a time as the animals live peacefully with plentiful food to eat. The pigs, however, seem to get a better deal as they act as leaders at every stage and have certain food items reserved for themselves for the upkeep of their health (as they maintain). Soon enough a power struggle begins between Napoleon and Snowball. The astute Snowball clearly has the more sensible ideas in favour of the farm animals but is constantly opposed by Napoleon, who is intent on gaining the upper hand. Snowball proves himself a capable leader as he anticipates and successfully thwarts an attack by Jones and the neighbouring farmers who fear the spread of these revolutionary ideas into their farms. Much to Napoleon’s chagrin, Snowball is hailed as the hero of the Battle of the Cowshed. Napoleon sees his chance to oust Snowball when Snowball presents his design of a windmill. Ridiculing Snowball’s efforts, Napoleon releases his dog (which was once Jones’ puppy) and orders it to chase Snowball off the farm. Under Napoleon’s leadership, life on the farm begins to change, slipping into a tyrannical regime under a committee solely comprised of pigs rather than a classless atmosphere where everyone has equal rights. Squealer, another pig, builds up Napoleon’s reputation by attributing the idea of the windmill to Napoleon and propagating a fear and hatred for Snowball to ensure that he is unable to return to a position of power. The pigs begin trading with humans, bullying their fellow animals, and even resorting to bloodshed, if needs be. They begin to adopt human ways by moving into the manor house, sleeping in beds, and drinking alcohol. Animal Farm is once again named Manor Farm. The height of the pigs’ deceptive ways is seen in Boxer the workhorse’s death. He is sent to the knacker’s instead of the veterinarian. The seven commandments are altered as and when it pleases the pigs. At the end of the play, the slogan of ‘Four legs good, two legs bad’ is changed to ‘Four legs good, two legs better!’ and the primary commandment becomes ‘All animals are equal but some animals are more equal than others’. The play closes with the pigs squabbling with their human guests at the manor house and the farm animals watching them are unable to tell the humans from the pigs. The premise of the play is that ideologies, especially political ones, are not perfect because they do not take into account the desire for power that is an innate trait. This desire for power and greed of money can distort and destroy what may have begun with the purest and noblest of intentions. Although the play has representations of key Russian political players of the time (Marx, Lenin, Trotsky, Stalin and others), it could very well reflect the political atmosphere of the present time with some influential countries threatened by the rule of megalomaniacs while others are already suffering under autocratic and fascist governments. The play tells us that ultimately we, the people, are makers of our own fortune. As long as we are subservient and turn a blind eye to injustice and evil according to our convenience, we allow tyrannical authorities to exist and repress the innocent. We live with the consequences of our apathy and our inertia. Animal Farm, as produced by The Mustard Seed Art Company, was an excellent presentation, with notable acting by all cast members. Special mentions are Ann Barreto Sousa (Major/Dog), Kiran Bhandari (Napoleon), Druv Usgaonkar (Snowball), Nalini Elvino De Sousa (Boxer) and the young Maya Afonso and Aryan Bhobe. Other cast members include Melanie Gareth (Minimus), Sushant Figueiredo (Squealor), Karishma Alvares (Muriel), Suvarna Bandekar (Moses), Anshu Moghe (Clover), Kimberly Noronha (Benjamin), Veda Bhandari (Puppy), Maya Afonso (Hen), Nigel Elias Khamkar (Mr Jones/Mr Whymper) and Kay D’Souza (Mollie). The play was co-directed by Isabel Santa Rita Vas and Israiel Sarvishta. Rui Lobo composed the music and the songs were beautifully rendered by Lara Condillac and Nigel Elias Khamkar.